The multi-GPU design from Nvidia bunches together multiple GPU dies and many DRAM dies interconnected with very fast I/O direct paths on a single chip. Remember the glory days of 3dfx and their multi-GPU cards? 3dfx tried to fit as many GPUs as it could on a single card, but they couldn’t come up with a cost-effective method, and this strategy lead to their decline. Nvidia bought all 3dfx proprietary technologies, but we haven’t seen many of these adopted by Nvidia, except for the multi-card SLI setups and dual GPU super high-end cards that cost a small fortune. However, in an attempt to bring a breath of fresh air to the GPU market, Nvidia plans to make the jump to a multi-GPU approach for its upcoming graphic card generations. This new approach is also known as MCM package (Multi-Chip-Module package) where multiple GPU, memory and controller chips are bunched together on a single chip. 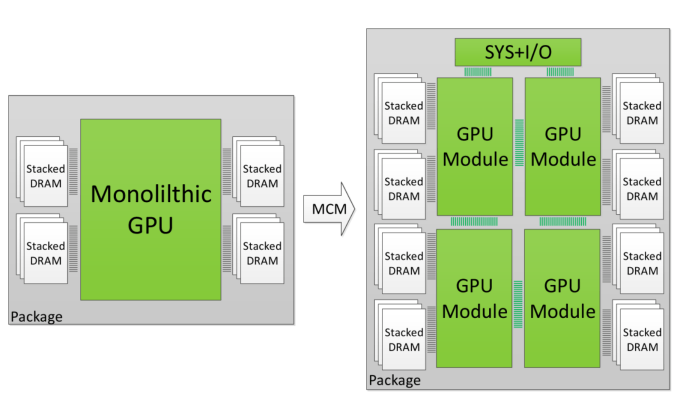 As opposed to the monolithic GPU design, the MCM design uses smaller GPU dies and more DRAM dies, all of which should be interconnected through very fast I/O direct paths. Nvidia claims it has already tested this design by simulating the performance of 4 GPUs, each with 64 streaming multiprocessors, for a total of 256 SMs. The setup resulted into 16.383 CUDA cores. For reference, the current flagship Volta GPU from Nvidia has 3 times less CUDA cores, while the simulated 4-GPU MCM saw a 45.5% increase in performance. AMD also announced a similar design for their future EPYC CPUs and upcoming GPU generations. As of now, a timeline for the release of Nvidia’s and AMD’s future chips hasn’t been revealed.